Yay!!! We have featured in the ABC News again! Hypnobirthing expert calls for standardised antenatal program in Australian hospitals by ABC Central Victoria Reporter Larrisa Romensky. I’m becoming bolder and bolder with my statements ? – but I know the importance of this issue. The conversation needs to be had. It is imperative that a high standard of positive, effective, childbirth education is made MORE accessible to MORE parents throughout Australia. I personally believe that there needs to be a more evidence based, standardised approach to childbirth education. One which incorporates effective teaching methods and relevant information and tools for parents. That’s what the Hypnobirthing Australia program is all about, and we are shouting it from the rooftops! So, let’s get the conversation going. Here’s a link to the article which was published on our Facebook page. PLEASE SHARE this article with your friends and community – and PLEASE LEAVE A COMMENT to let us know your thoughts. What do you think of the antenatal education that is currently made available in our hospitals? Would you like to see the Hypnobirthing Australia program made more widely available? How do you think this could benefit mums, babies and the community? Let’s bring this important topic to the forefront of public conversation! It is time. Australian hospitals each deliver different antenatal education programs and now one birthing expert is calling for a more standardised approach. 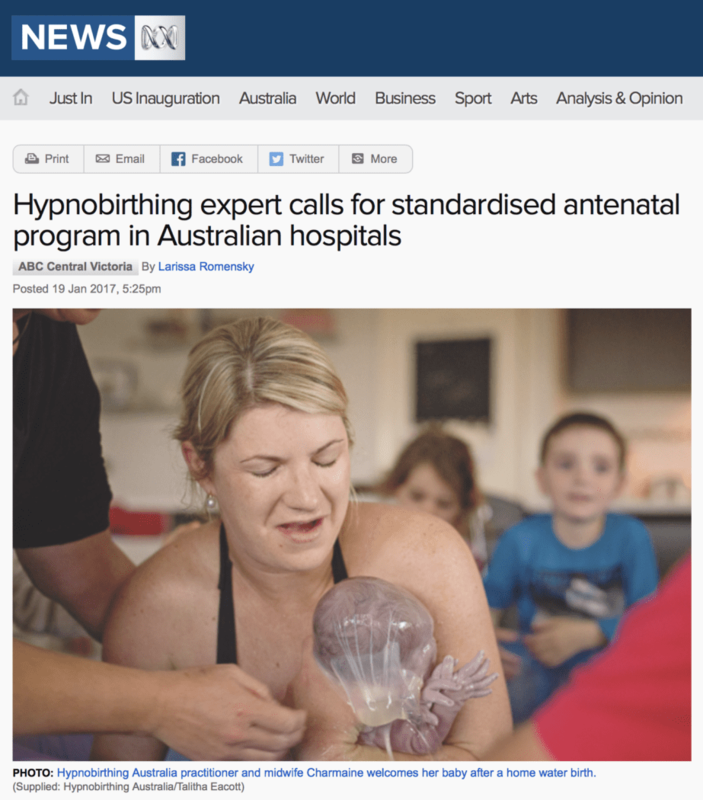 Hypnobirthing Australia director Melissa Spilsted would like to see a standardised, evidence-based antenatal education program introduced across all Australian public hospitals. “Every state is doing their own thing, every hospital is doing their own thing,” she said. “They’re all running their own individual antenatal program so we don’t have consistency across the board. Ms Spilsted’s particular concern is the lack of publicly-funded alternative options for birthing, including complementary therapies. But La Trobe University director of teaching and learning Michelle Newton said while there was not a standardised antenatal program across the country, there were national antenatal clinical practice guidelines as part of a Federal Government initiative. “There’s no actual clear, dictated approach to antenatal care that you would find in every public hospital,” Dr Newton said. “Most hospitals would offer a very traditional model of birth preparation, which would be a lot of information-sharing about the process of birth and what happens, and what women can do and what techniques they can apply. Hypnobirthing is the practice of relaxation and self-hypnosis while going through childbirth. Ms Spilsted said her antenatal education program incorporated a range of different complementary therapies such as relaxation, self-hypnosis and breathing techniques. There are 130 practitioners in Australia as part of her organisation, with several private hospitals and health services in the country offering the course as part of their antenatal program. Midwife Melissa Corbett from Bendigo’s St John of God Hospital sitting on a hospital bed in a birthing suite. One of those hospitals is St John of God in Bendigo, which started offering hypnobirthing classes late last year, with 15 women so far taking up the opportunity. “We just thought hypnobirthing has shown positive experiences in more natural birthing approaches, and the women seem to be more satisfied with this,” maternity unit manager Shirley Lechmere said. Having spent 40 years as a midwife, she said women were more informed and were looking for alternatives more so than when she started in the field. “They don’t just come along and book in for a baby and allow us to take charge,” Ms Lechmere said. 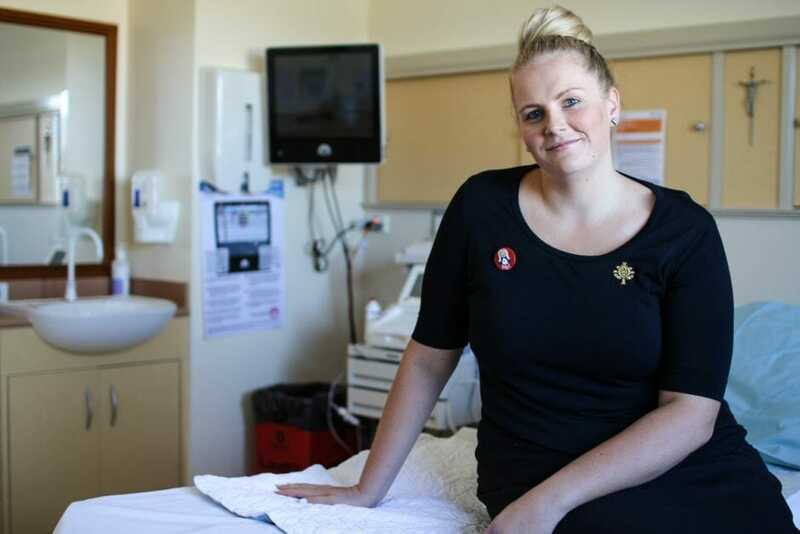 The new $630 million Bendigo Hospital nearby is one of the few public hospitals in Australia to offer a well-established continuity of care model in midwifery, but it does not offer hypnobirthing classes. Many midwives who work in the public hospital system teach the course privately. While in Australia hypnobirthing is not available under Medicare, it is a different story in the United Kingdom. Many public hospitals in the UK fund the growing demand for hypnobirthing under some National Health Service (NHS) trusts. Ms Spilsted attributes the steadily growing popularity of hypnobirthing in Britain to a more “progressive” and standardised approach to maternity care than the Australian public health system. She said Australian public hospitals did not have a suite of alternative options available for women. “And the midwives are calling out for this,” Ms Spilsted said. A hypnobirthing course that involves partners holding each other. Midwifery lecturer Dr Newton said there was not a lot of “strong” evidence to support one particular antenatal model over another in terms of effectiveness. “It is a very individualised choice for women to select a preparation model that suits them, because there isn’t a gold standard in child birth preparation that could be seen as the best and should be accessed by all women,” she said. But she does acknowledge there are many models of pregnancy care that reduce intervention rates and caesarean rates which are not accessible in all hospitals. Ms Spilsted said while not all women would use all the techniques in her course, it allowed women to “draw upon what they need to” during birth. “The one thing that is consistent is [that] the absolute majority of people who do prepare themselves well for their birth have a positive birth experience, however that birth turns out,” she said. An Australian pilot study conducted in 2006 found women who were taught antenatal self-hypnosis in labour and childbirth received fewer epidurals (36 per cent) compared with the control group (53 per cent). “We know that if this was made more available to more women, this would actually make a very big difference to women’s birth experiences, to babies and also post-birth as well,” Ms Spilsted said.